What does it mean to be a UX designer during a time when technology is beginning to enter our physical lives? From parking lots that tell us how many spots are available in a parking garage to stop light sensors that allow for better flow of traffic, cities all over the world are making use of IoT in order to make daily routines easier for everyone. We often see that technological advances tend to have a domino effect on other industries that exist, such as how the internet pushed publications to gain a virtual appearance for the first time in history. 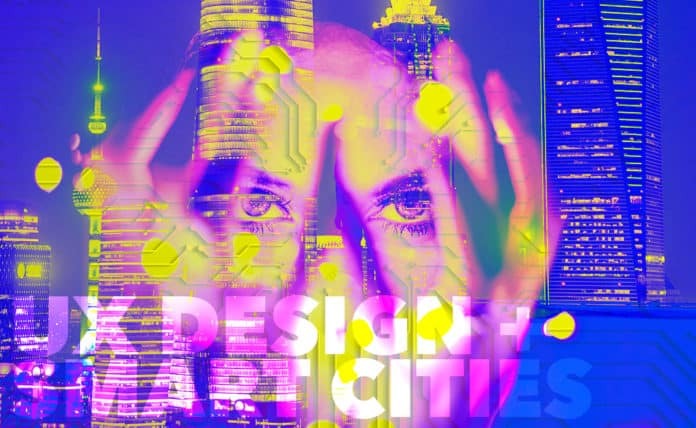 So what does the rise of smart cities mean for the design industry? More specifically, what does user experience mean in a world where technology has been lifted out of our monitors, and into the physical world we experience on a day to day basis? This article is intended to give you a brief explanation of user experience, and explain its significance in smart cities. In order to truly understand the scope of user experience and its impact on smart cities, we need to start off by understanding what a smart city even is. In a previous article, Benson Chan mentioned that “smart cities are built on technology, [but] focused on outcome.” In other words, while the foundation of a smart city depends on the technology used to build it, its main priority is to provide value to the general public. City optimization allows outcomes to be seen in the following areas: government efficiency, sustainability, health and wellness, mobility, economic development, public safety, and quality of life. With these seven different goals in mind, user experience acts as the translator in integrating the virtual world with the physical world in order to create a smoother information sharing. In 1988, Don Norman, a UX design expert, coined the term “UX Design” in his book, The Design of Everyday Things. Today, when we hear professionals refer to themselves as UX designers, we automatically assume that they work in the tech field, and that their work exists in the digital landscape. The reality is that user experience goes beyond the virtual space. Almost everything that we interact with has in someway been shaped or thought through by taking the end user’s thoughts and behaviors into consideration. Never go to the grocery store hungry as it will result in unnecessary, and most times unhealthy purchases. To remain around the perimeter and start in the fruits/vegetables section first. This prevents temptations to buy those cookies and chips in the aisles, and encourages better eating habits. Ok, great lecture, but what does this have to do with user experience? Well, these rules are governed by the patterns of architectural design systems that grocery stores tend to follow. It’s very similar to web design. While there’s a desire to reinvent the wheel, the structure of a webpage always remains the same: navigation (regardless of where it’s placed), the content (regardless of how it’s laid out), and the footer (regardless of how much content is actually in it). In a similar fashion, we can think of a grocery store’s perimeter where all the real, perishable food exists as the navigation. It’s the outer shell that’ll guide you on the right path, and its layout is consistent with every other grocery store. The aisles of a grocery store resemble the content layout of a webpage. Each grocery store consists of different options, but the general layout still has some structure and organization. Finally, the checkout lanes can be thought of as the footer of the webpage. It’s the place that users/customers go to ask for help, and wrap up their visit. UX design, like most other things, thrives off of design systems. Reinvention of the wheel is therefore disastrous in most cases as the user’s experience may be in compromise. Ok, so we now understand the role of UX design and what it actually means. But what does it mean to be a UX designer during a time when technology is beginning to enter people’s physical lives? What happens when the digital world becomes intertwined with the physical world? Answer: a whole lot of organization happens. The role of a user experience designer in a smart city will not differ a whole lot from what currently takes place. The applications, however, will. As mentioned earlier, UX designers are far too often thought of as workers in the digital landscape, but with the rise of smart cities, we will most likely see UX design with applications in the physical world. For example, a job that may ask for 3+ years of experience working with prototype platforms such as Sketch, InVision, etc. today, will most likely ask for the designer to also have experience with physical product prototypes in the near future. A “Product Designer” therefore, will have more of a literal meaning. For each of the outcomes listed above, there will need to be multiple UX designers on hand to filter through the digital experience as well as the physical experience. Multiple other sets of designers will be required to translate the experience between the different areas. For example, there may be two different UX design groups working with the department of transportation to create better flowing traffic systems that oversee all traffic patterns and act to take preventative measures against accidents. The first team will be in charge of working with engineers and architects to aid in the physical design of the roads and infrastructures. The second team will be in charge of working with software developers to produce the backend platform design that will be used to send and receive data. For our purposes, we will call these teams the hardware team and the software team respectfully – call it IoT if you will ;). Furthermore, these systems will be able to detect accidents before they’re even reported to officials and send out the necessary teams to help clear up the accident before it causes congestion within the city. The police department in the county that the crash takes place. Each of these three teams will have a hardware team and a software team of UX designers, but they will also require an intersecting group of UX designers that aid in the relationship between each group. This group of designers will then take the data transfer that takes place between the different groups and outline the experience of the general public that occurs as a byproduct. This is perhaps by far the most important group as it unites all of the different organizations that exist in a smart city in order to create a cohesive, and optimized experience for the general public. The major challenge that lies ahead for all of these teams and organizations is bringing together a team of designers, engineers, developers, and project managers that work and communicate well together. The people working on these projects are the ones who allow smart cities to run like well oiled machines. Without constant communication and understanding of other team’s capabilities, the developing components of smart cities are bound to fail. Many people believe that robots and automation will soon take over many people’s jobs, but my rebuttal to that is that human beings have the one weapon that is difficult to teach inanimate objects: empathy. The use of empathy both in our technical projects and our daily lives will help in creating the unified cities that we all wish for. Why is AR/VR Synonymous with Gaming?